“You are the light of the world. A city that is set on a hill cannot be hidden. Nor do they light a lamp and put it under a basket, but on a lampstand, and it gives light to all who are in the house. 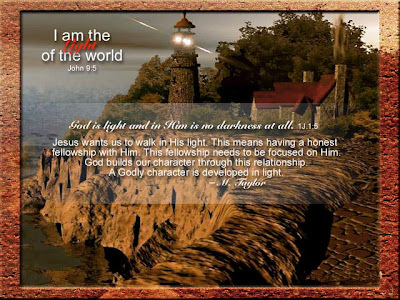 Let your light so shine before men, that they may see your good works and glorify your Father in heaven." (Matthew 5:13-16). We know how to be light. We let our Christian lives shine brightly, the fruits of the Spirit evident (Galatians 5:22-23) as a sweet perfume. (2 Corinthians 2:15). The darker the evil, the brighter the light. Don't be a match. Don't be a lighter. Don't be a candle. Don't be a flashlight. Be a Fresnel lens! A fresnel lens is a fixed lens of circular disk of stepped prisms. "A Fresnel lens is a type of lens originally developed by French physicist Augustin-Jean Fresnel for lighthouses. The design allows the construction of lenses of large aperture and short focal length without the mass and volume of material that would be required by a lens of conventional design. It is a thinner, lighter lens made with separate sections mounted in a frame. Compared to conventional bulky lenses, the Fresnel lens is much thinner, larger, and flatter, and captures more oblique light from a light source, thus allowing lighthouses to be visible over much greater distances." (source). Science makes a better lighthouse lens: "State of the art, one of the seven wonders of the Ancient World, the great lighthouse of Alexandria, built around 280 B.C., towered some 450 feet above Egypt's greatest harbor. At that height, it was the second tallest structure in the world, after another of the seven — the Great Pyramid of Giza. The light within, also state of the art, was an open flame. From that time until the 18th century, the lights that warned ships that they were approaching land improved hardly at all. Some burned coal. Others stuck with wood. Oil lamps backed by mirrors eventually offered a bit more candlepower. Still, every coastline in the world remained littered with the ribs of broken ships whose captains didn't see the lighthouse until it was too late. Then, in 1822, a frail scientist with a passion for optics made a revolutionary breakthrough. His name was Augustin Jean Fresnel. An example of his greatest creation, a large object that looks like a crystalline beehive, is his lens." It was the most important breakthrough in light magnification in 2000 years. (Aside from Jesus Himself, that is!). All prior systems paled by comparison with the Fresnel lens. So even light has different qualities and magnification levels. I hope you strive to be big and bold and shine with the bright, refracted light of a Fresnel lens! But salt? How does one be salt? We know that salt is a preservative. With no refrigeration in past days and lands, salt is the medium used which preserved the meat from decay. I read that in the Old Testament times that covenants were sealed with salt, salt was exchanged. Roman soldiers were paid in salt, that is where we get the phrase "not worth your salt" from. If we put too much salt down, it will kill the thing we are trying to preserve. If we use too little it has no sting, no flavor, and is useless. "You are the salt of the earth. But if the salt loses its saltiness, how can it be made salty again? It is no longer good for anything, except to be thrown out and trampled underfoot." (Matthew 5:13-16). Being salt is not as appealing as being light. Everybody breathes a sigh of relief when the lights are turned on, especially after a long night hiding in the tornado closet with the power out, or after a lengthy period of darkness of any kind. Light is welcome. Salt is necessary, and often it is unwelcome, because as mentioned earlier, it stings. But this cultural climate of tolerance and love and false humility and meekness is simply a means to lull the Christian that they don't need to be salt, too. Well, we do. You've heard "pouring salt in the wound" and that means causing someone pain by applying stinging salt to where there is a wound. But sometimes we do have to cause pain or upset if we have to rebuke or exhort, saying biblical truths to people who have forgotten them, or who don't want to hear them. You know what? Pouring salt on a wound does sting but it controls infection. Christian, don't abandon your duty to be light AND salt. It is all for His glory.